Today I felt like soup, having another of my moments so soup it was. 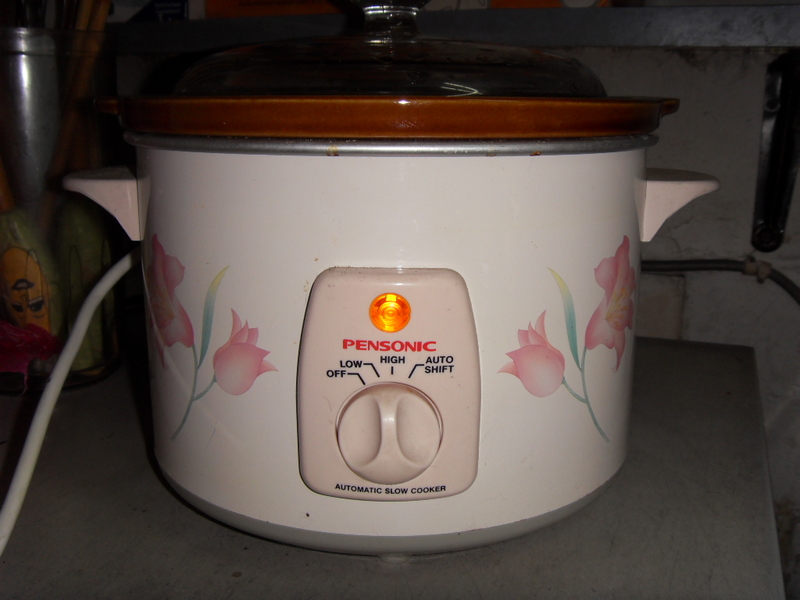 And this time I wanted it done in the slow cooker which I bought last year I think, and only used it once. 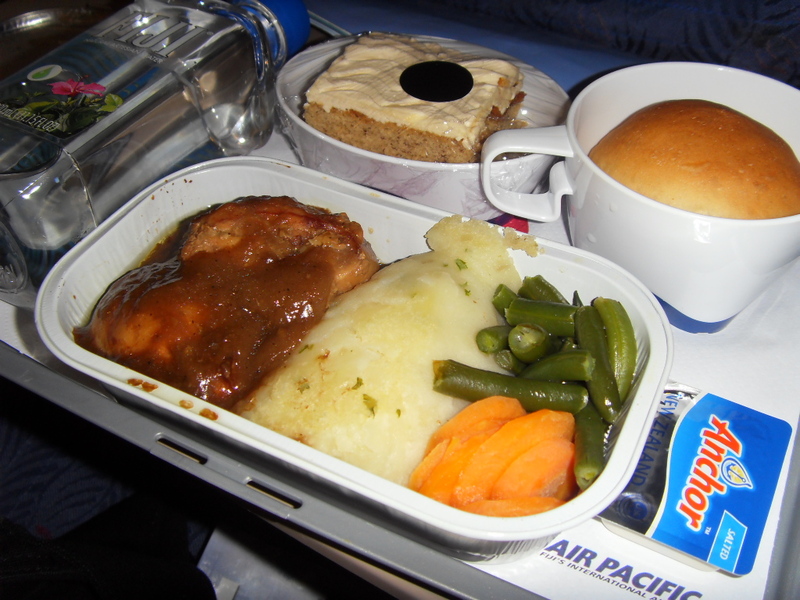 In fact for a while I could not find the cooker at all, as my wonderful maid Eda left the box somewhere else. So today I found it. I really did not know what I wanted so I checked the fridge and found a lots of odds and ends, thanks to Yustina’s method of storing. So here is what I found. 1. 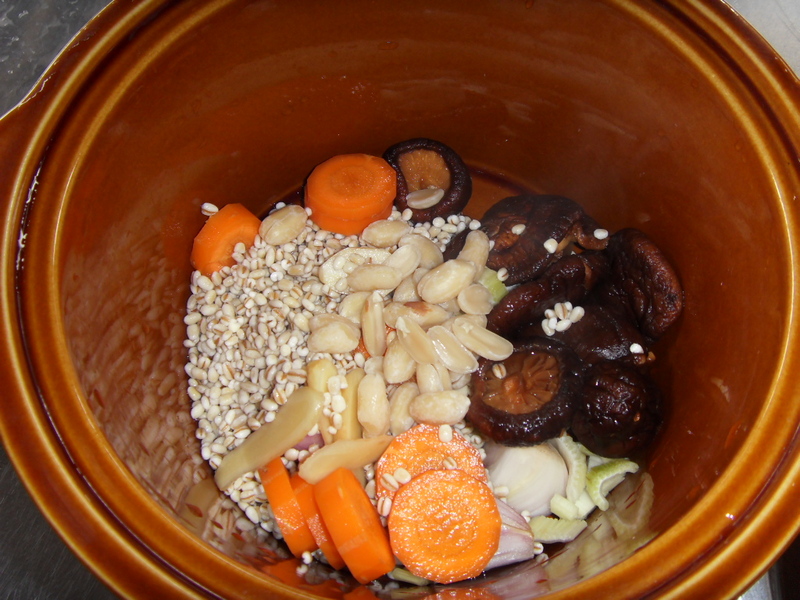 Pour all the stuff above except the Chinese Cabbage into the crock pot. 2. Add water. 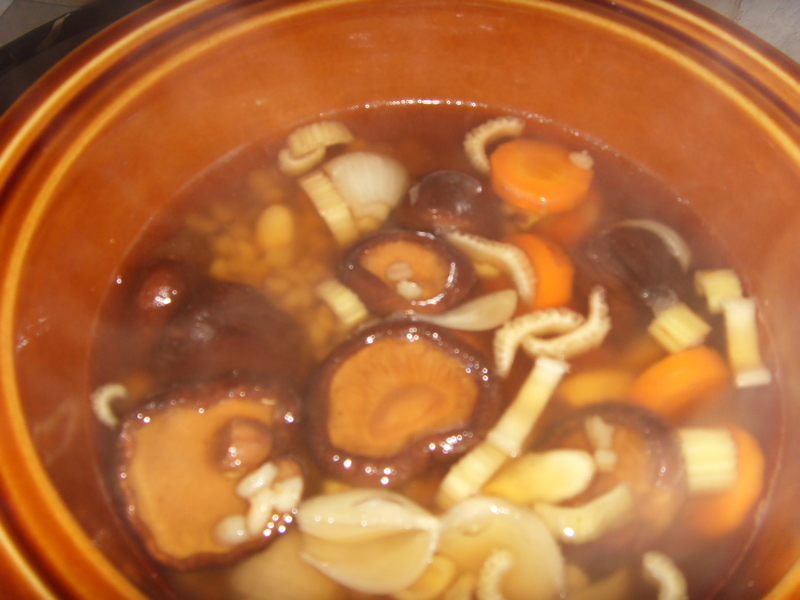 I even added in some of the water I soaked the mushrooms in. 4. 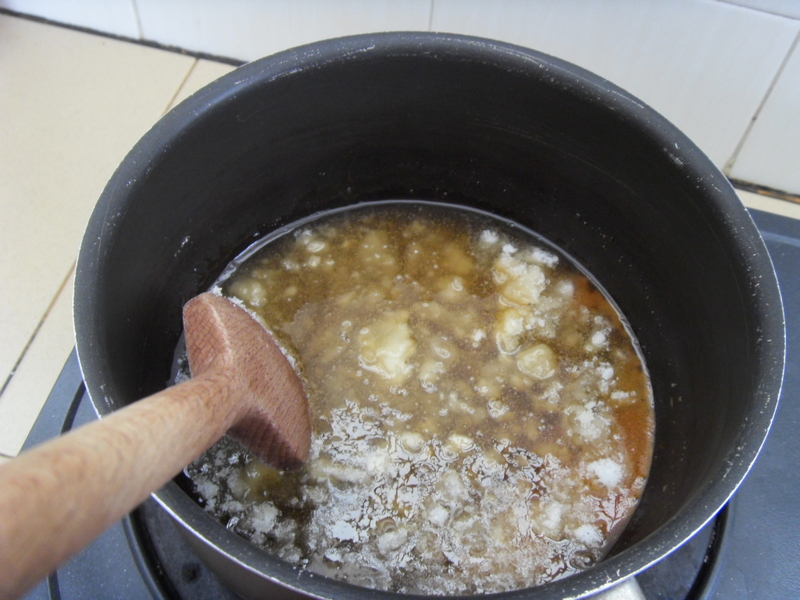 I am still boiling it now it is 10 hours and still the peanuts are a little hard. 5. So lets see how it will be 12 or 14 hours time. 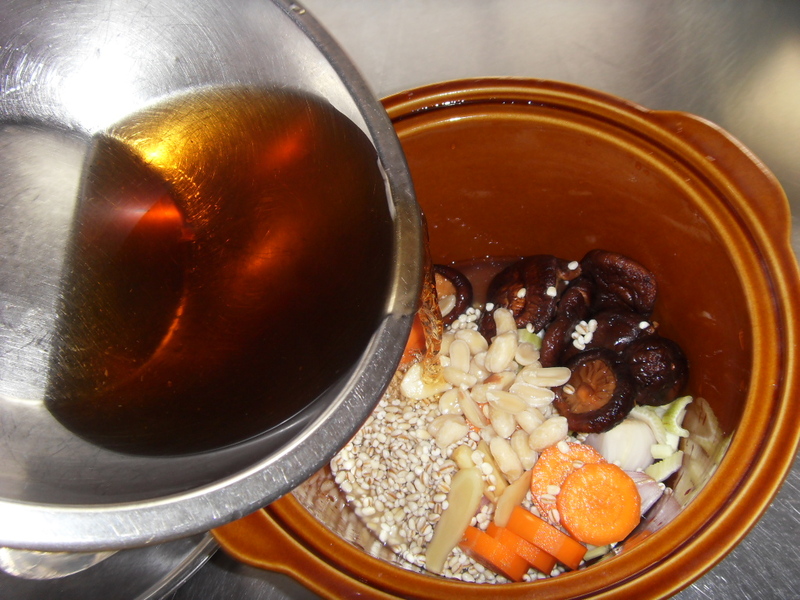 I am giving part of the soup away to a friend who has the cough for a few weeks now, hopefully it will help him. 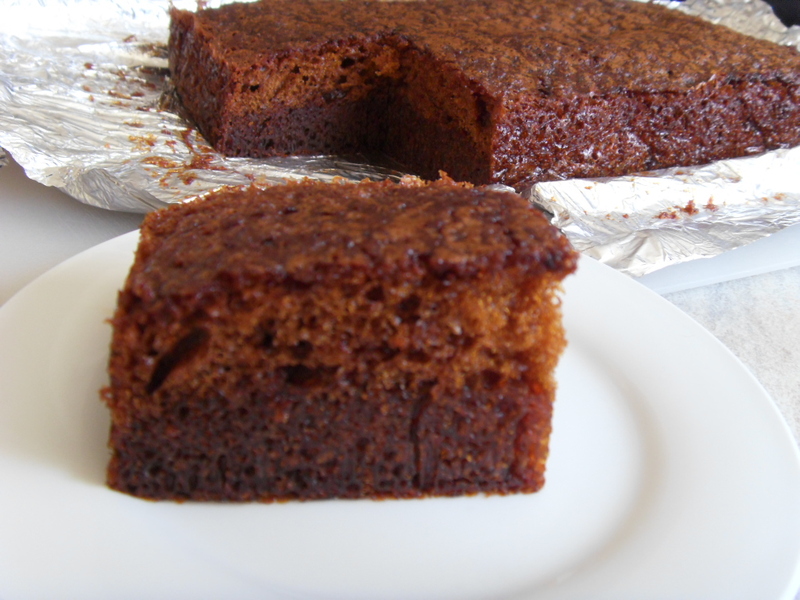 I have never made this cake in my life because all the time I have tasted it I never liked it as it was not fluffy, dense, and sometimes too much of certain ingredients. Mum, has often hassled me I think since as long as I can remember to make this cake, so after nearly 20 years (Yes, Patience is a virtue) I made it. All because I was in a good mood and the fact that the butter I needed to try out some cookie recipes was hard as rock. Anyhow, this is a Malay recipe and I am sure in the beginning there was no use of ovens and all. So I am sure too the end result would be different. While we use all the modern amenities around, I am sure the ladies back then used a hand whisk. Pour in hot water little by little and let it boil. 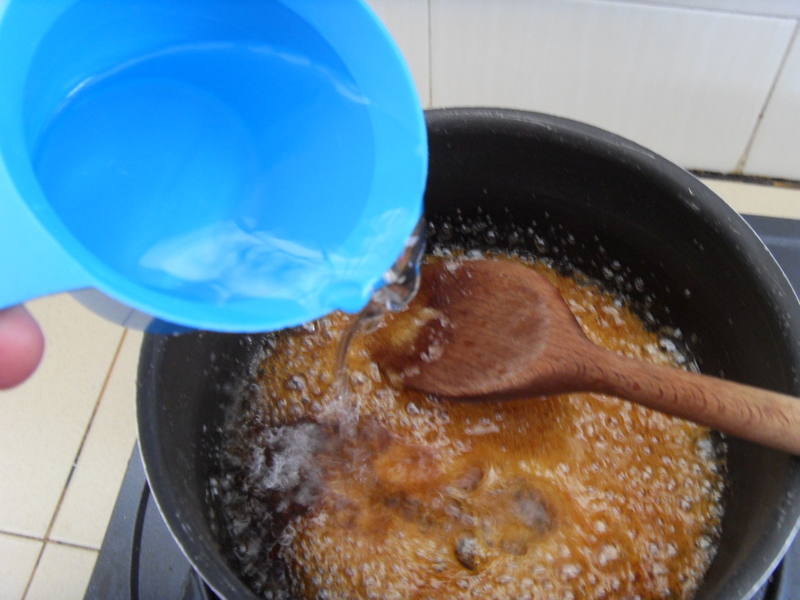 Always be careful as the reaction of the hot sugar and water can result in pure hot sugar splashing on your hand. Let it boil lightly and throw in the butter. 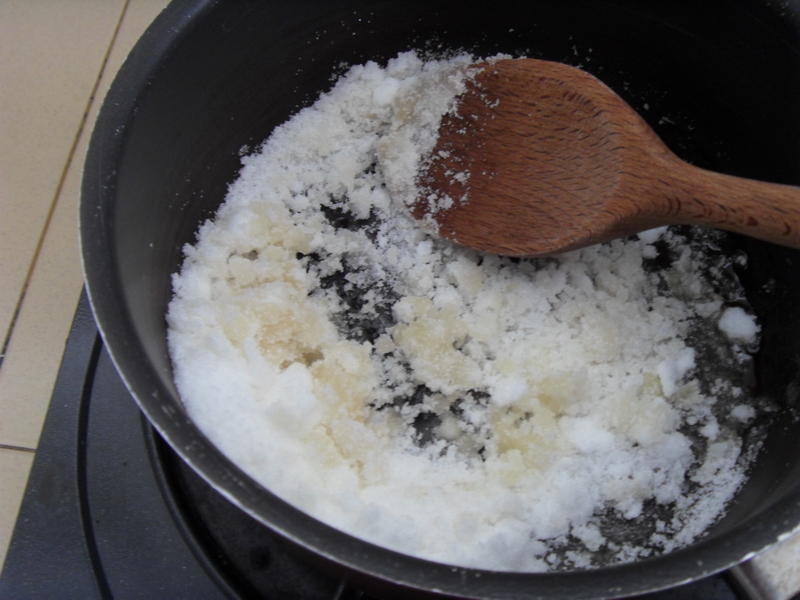 Do not melt the butter completely, remove from flame and leave to cool. Stir it from time to time. You should have a nice butterscotch taste. 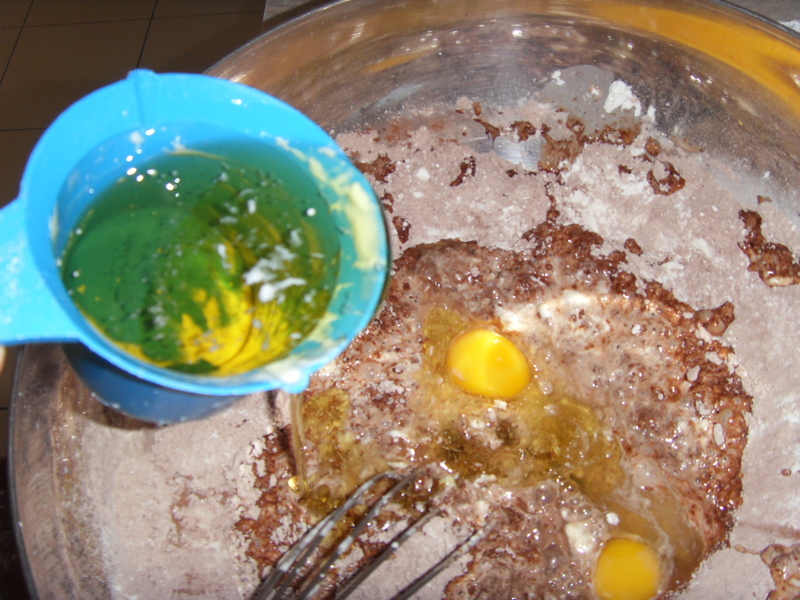 In the mean time, beat the eggs, add in a pinch of salt. 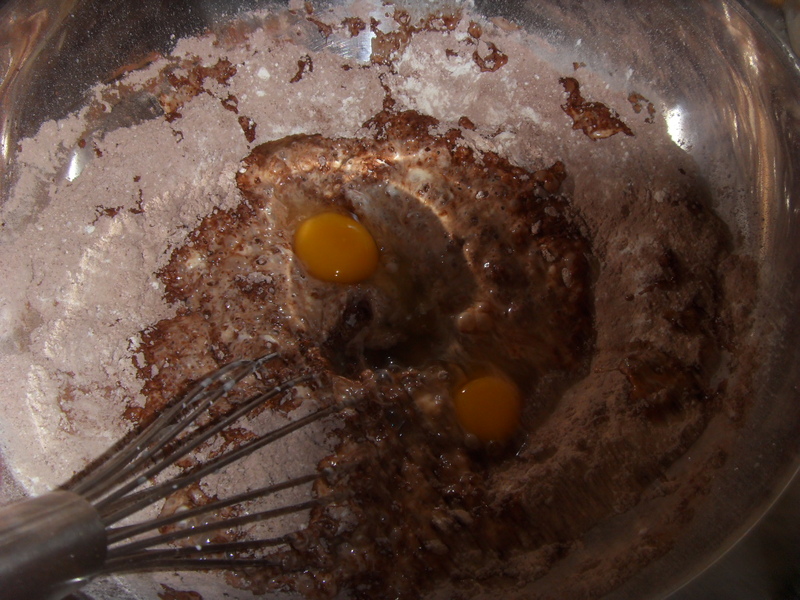 Eggs should be beaten till it is a light yellow and very fluffy. 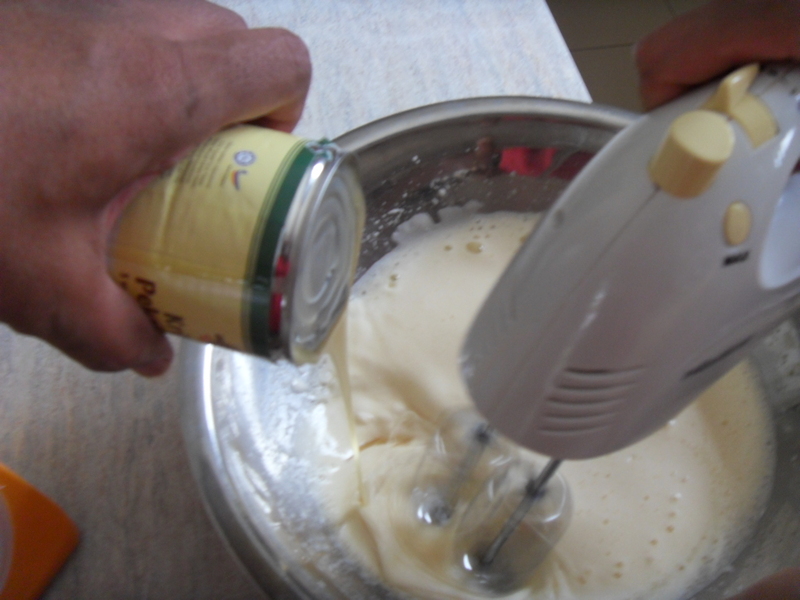 It is best to use a mixer if it is available. 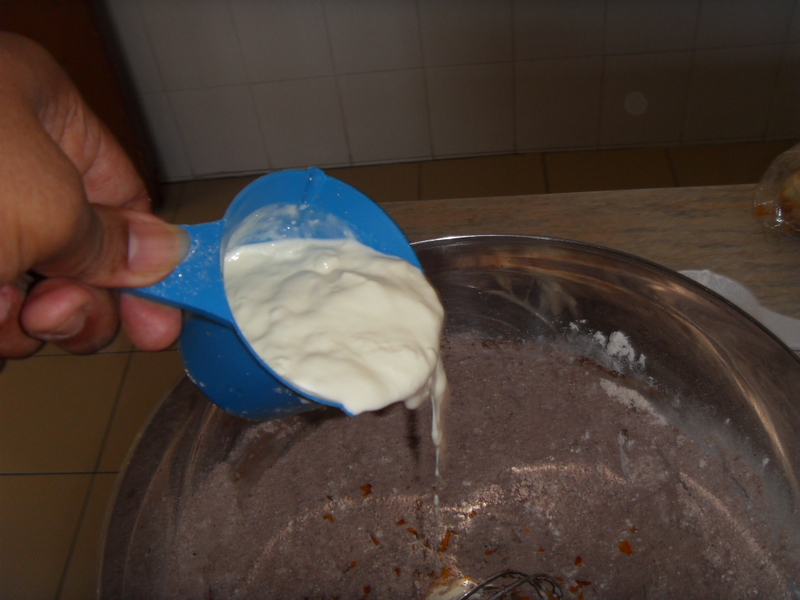 Pour in condensed milk and carry on mixing till it is fluffy. 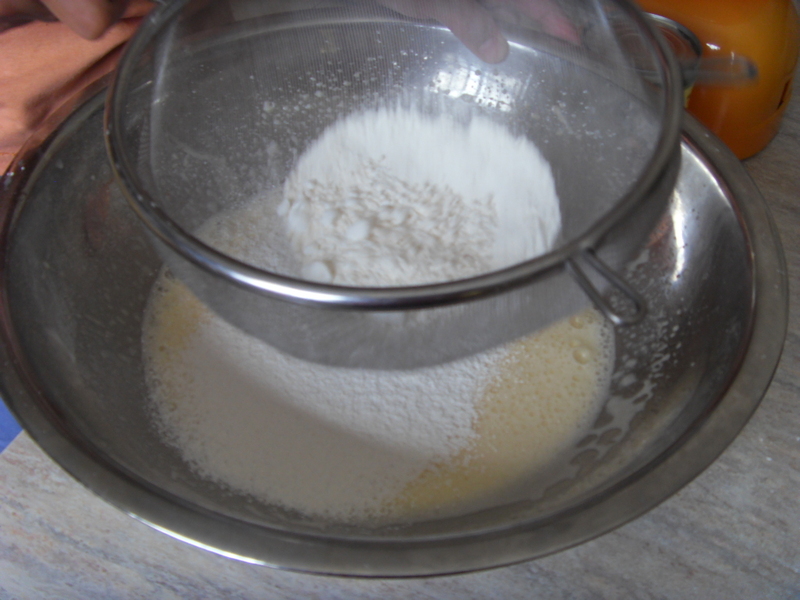 Sieve in the flour and the bicarbonate of soda. Fold in gently. Ensure there are no lumps. 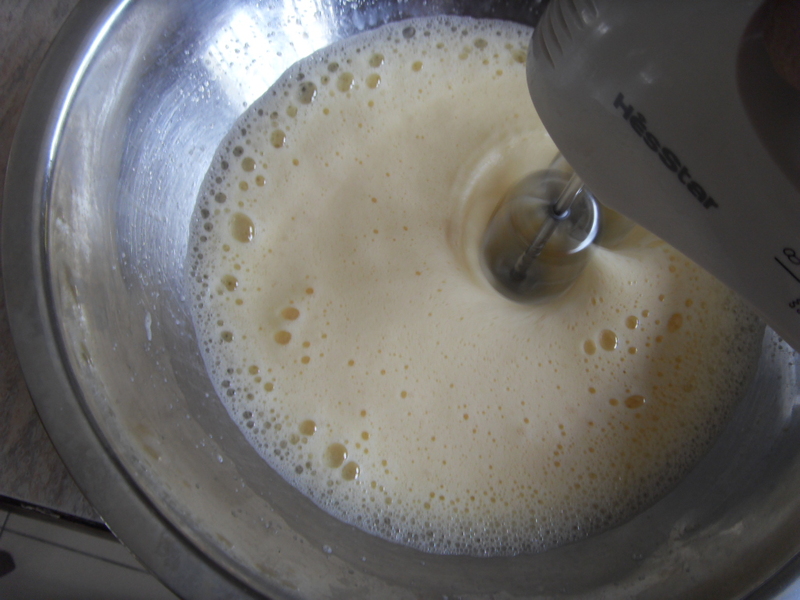 If there are lumps then whisking. 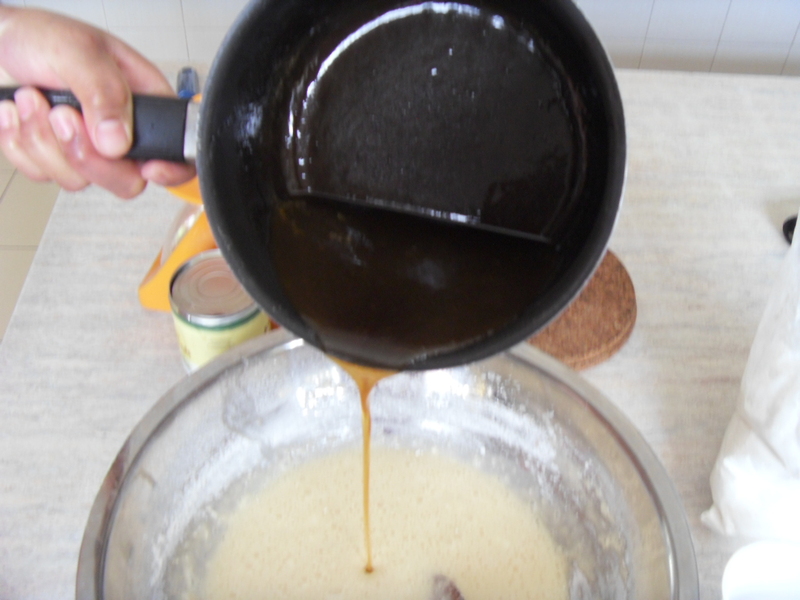 Pour in the butter sugar mixture and whisk it with a hand whisk. 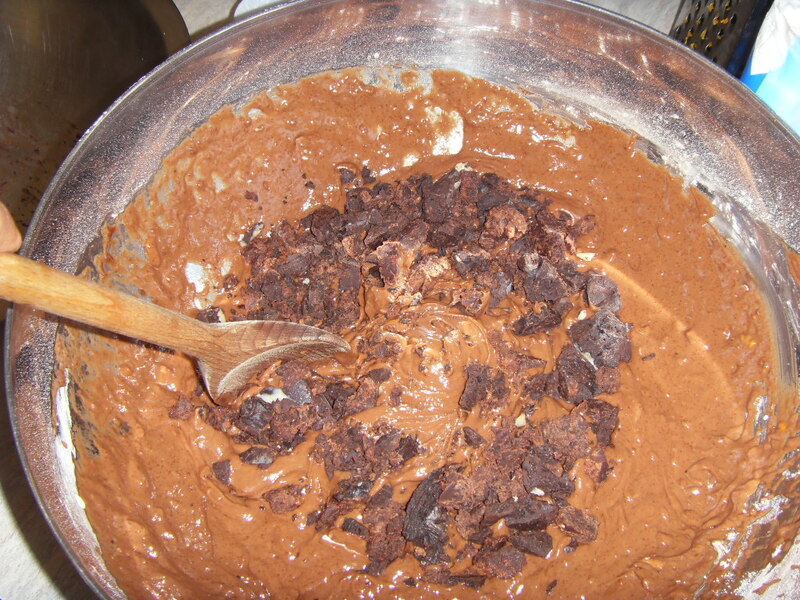 Leave the batter to rest for about 1 hour. In the mean time, prepare a cake tin. I used a 20 cm x 14 cm. I think a slightly smaller tin would be better so the cake will look thicker. 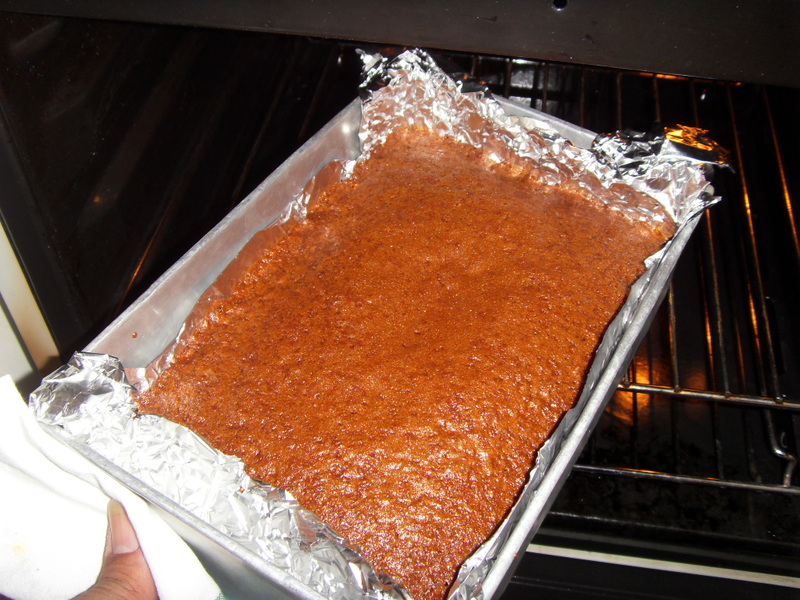 Line the tray carefully with aluminum foil as shown. 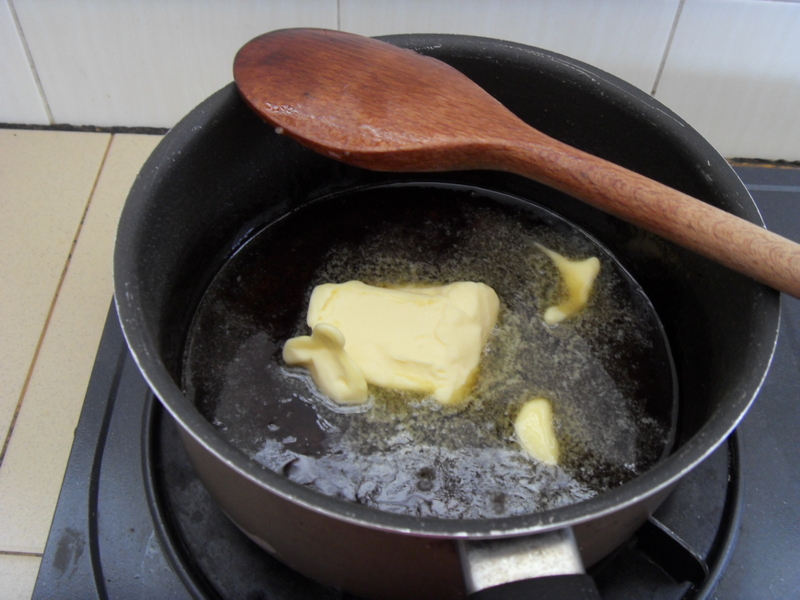 Brush with butter. 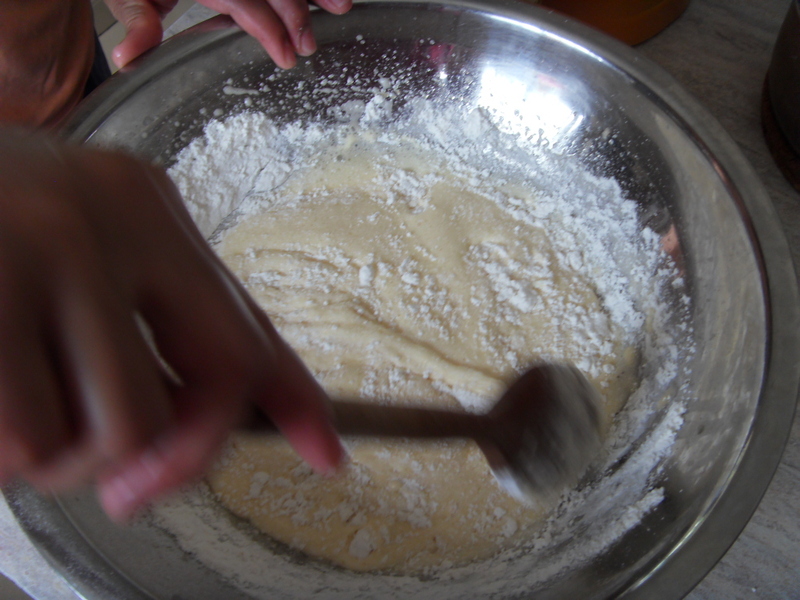 Preheat the oven to 160 to 170 C.
Before pouring in the batter into the tray, whisk it to mix it up one last time. 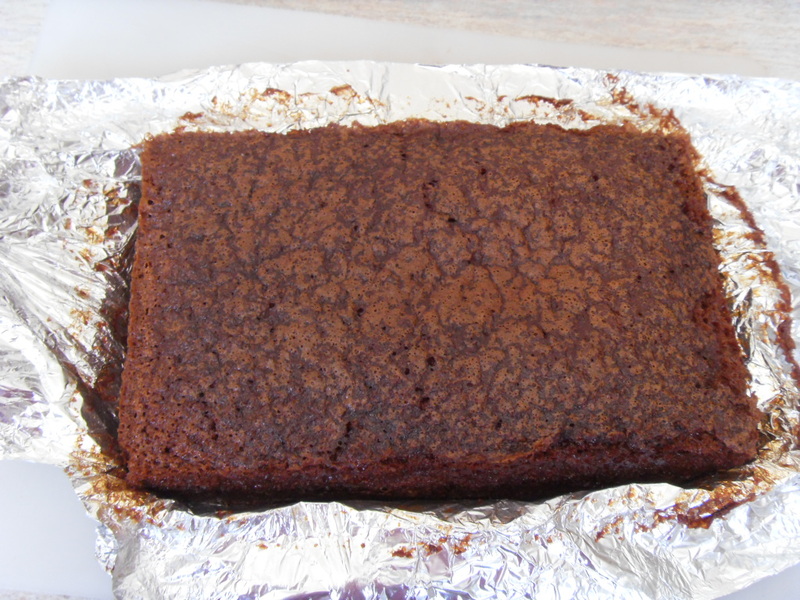 Pour into cake tin and bake for about 40 to 60 minutes depending on the thickness. Once a skewer comes out clean, then cake is done. I ate it straight away. You are suppose to wait till it is cold. Remove it from the tray and leave it out. Cut it when it is firmer. So they say. On the second day I was there, I followed Angela around and after dropping of Meretalai as school, we went to the market which was nearby. 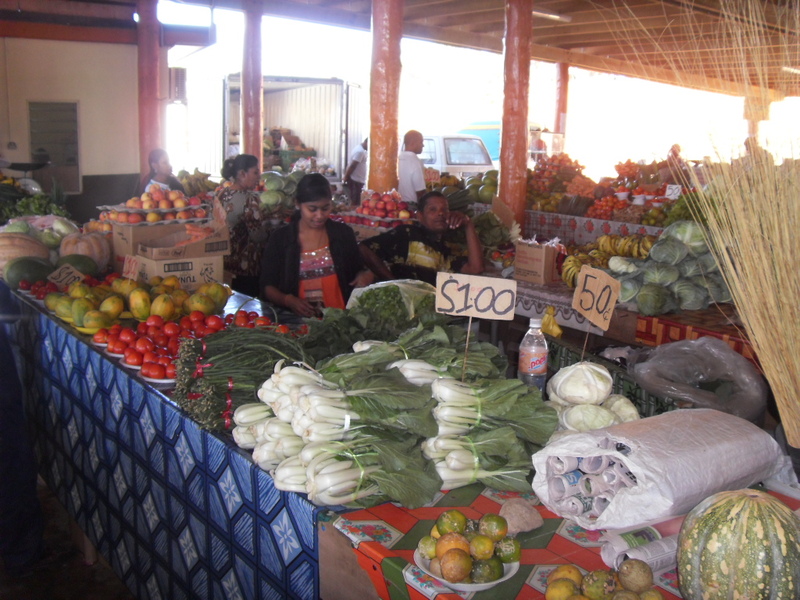 So this is my first trip to a Fijian Market. It was not very big, and the fact that it was the main market it was quite small by our standards. One thing though, it was neat and clean. For one I am not the market kind of person. I’d shop at a supermarket any day. After shocking episodes when I was a kid following mum to the market and wanting to throw up and all, it has always been something I do not look forward to. My sister was even worst, she just dropped like a big fat rock overcome by the smell of the market and mum had a fright of her life so we were never allowed to go to the market again. I believe this is not our fault at all but just the way the market system works here. So here goes. 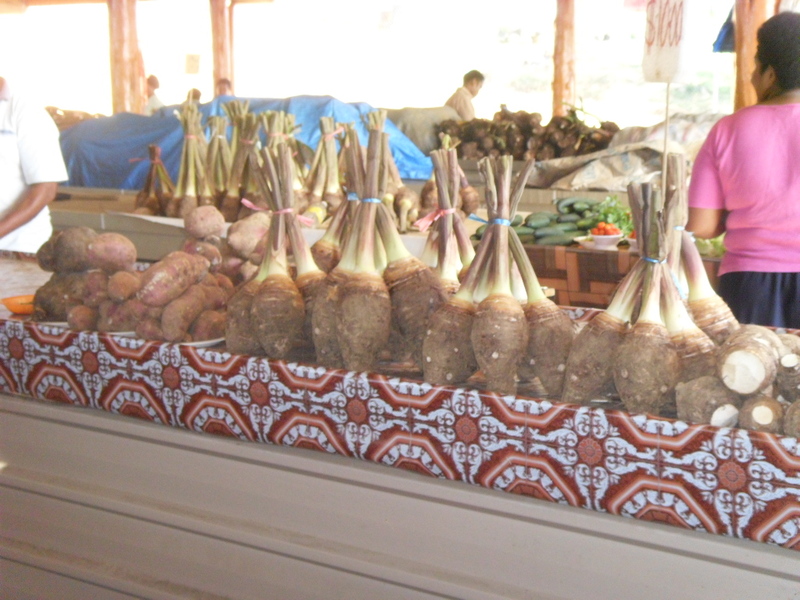 The first photo shows how vegetables are arranged in this market. Most cases these are the people who produce these fruits and vegetables themselves and so you see a mix of vegetables and fruits sold by the same person. So in most cases again, these are very organically grown produce. 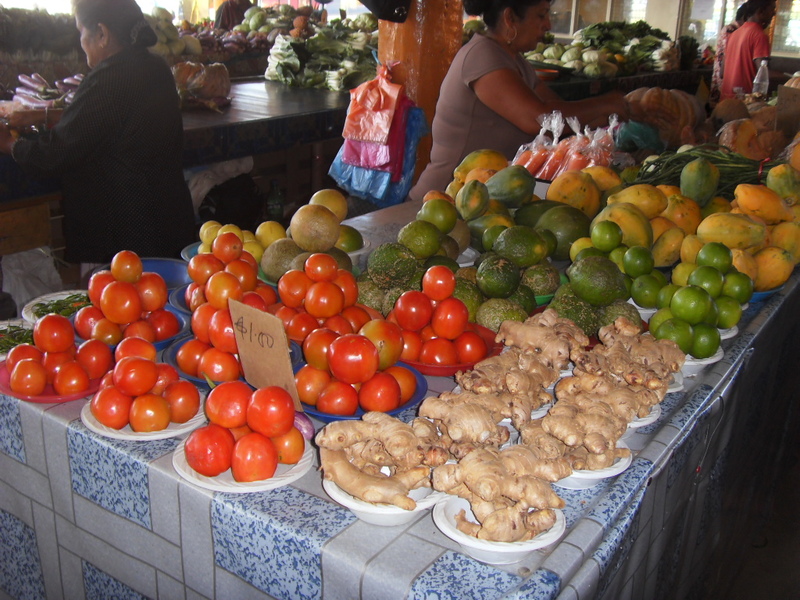 Notice too how the fruits and tomatoes and even the ginger is placed on little plates. I thought this was a rather novel idea instead of having to rummage through all these produce and get our hands all messed up with fertilizers and stuff. Some even have table cloth. Most of the stall are run predominantly by Indians. Notice how big the pak choy is? Even in the background just see how large the pumpkins are. 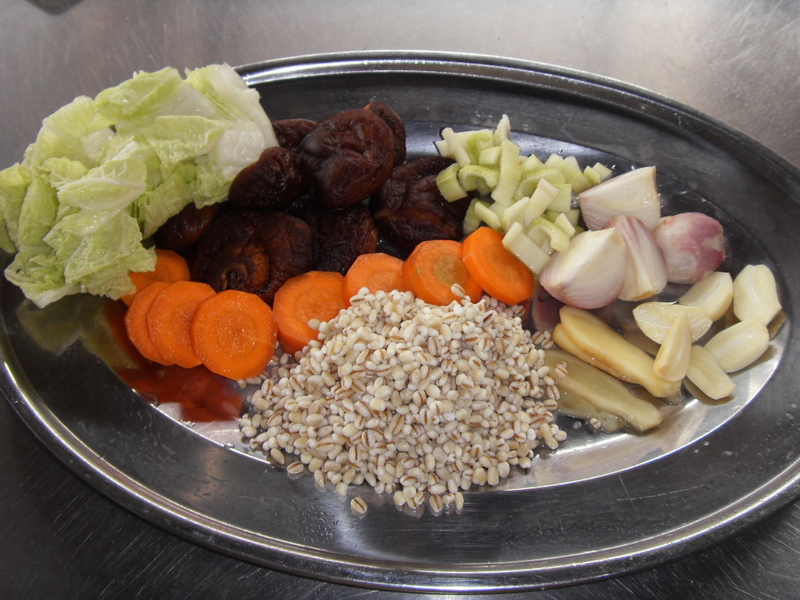 Most of these vegetables seem to be larger then what we get here in Malaysia. And you can even get your newspapers if you want. And yes they sell Sasa brooms (Lidi Brooms) too. 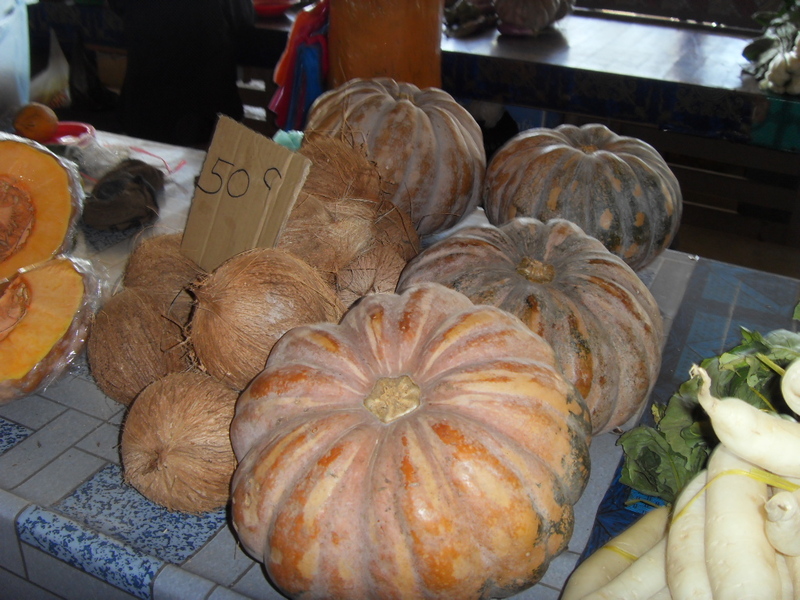 These next photos show how large the pumpkins are, and even the cabbages. These large Pumpkins looks like the ones you find in the US. I did not get a chance to taste it. But it would be difficult to finish even with a large family. Funny I only noticed old ginger compared to the choices we have here. Old ginger tends to be stronger in taste, and sharper and hotter. I walked all around and found no young ginger. 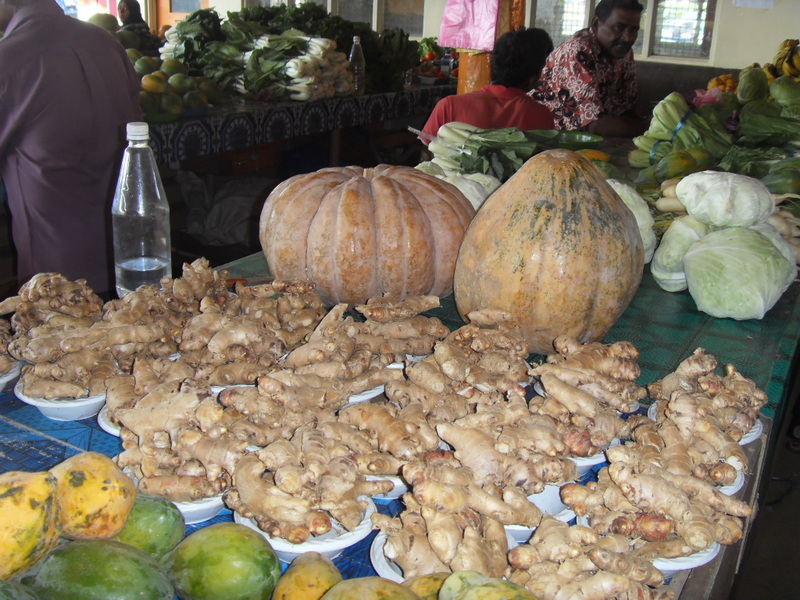 I wonder if they know the uses of young ginger as sometimes what we take for granted, people from other countries have no idea a certain fruit or vegetable is edible. 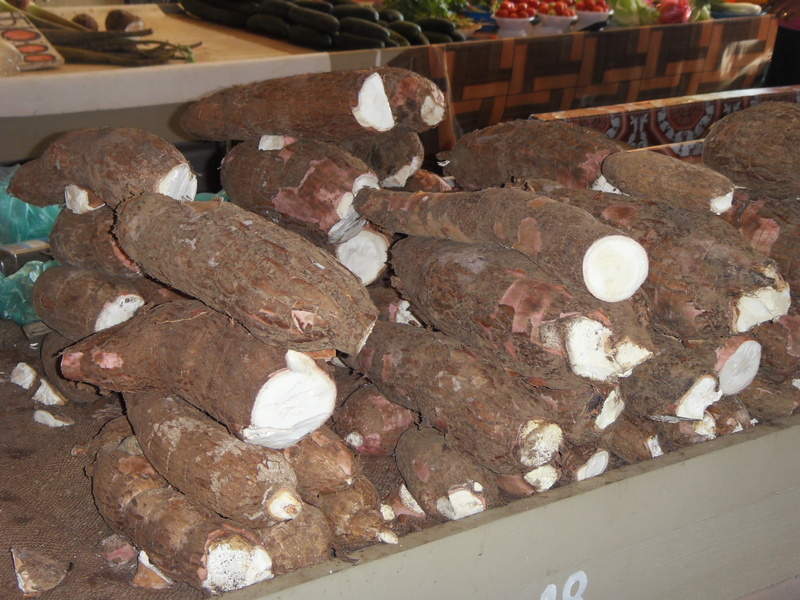 Now this is Dalo or Taro or Tapioca, a very important food here in Fiji. Funnily enough, Angela did not give us any to eat. How strange? 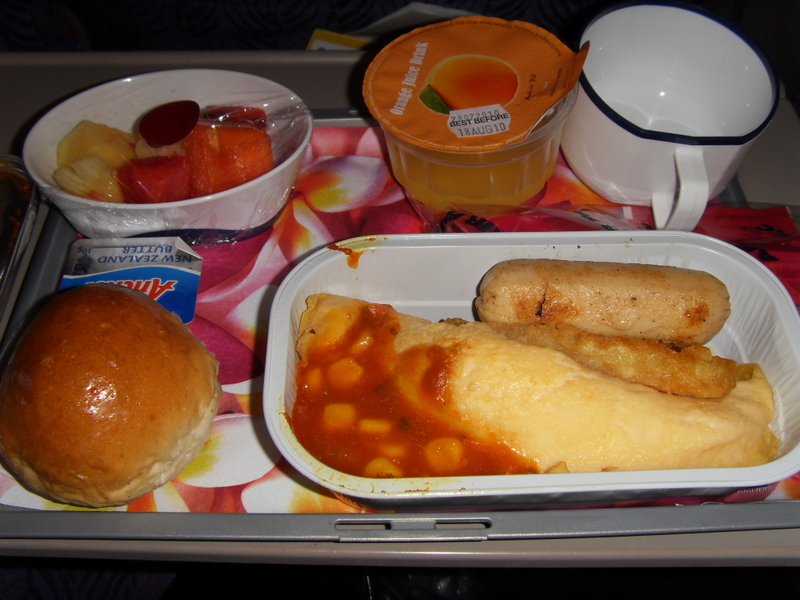 Because I am sure Aunty Ana would have given us some to eat. Dalo is eaten even in Chinese restaurants as a starter. 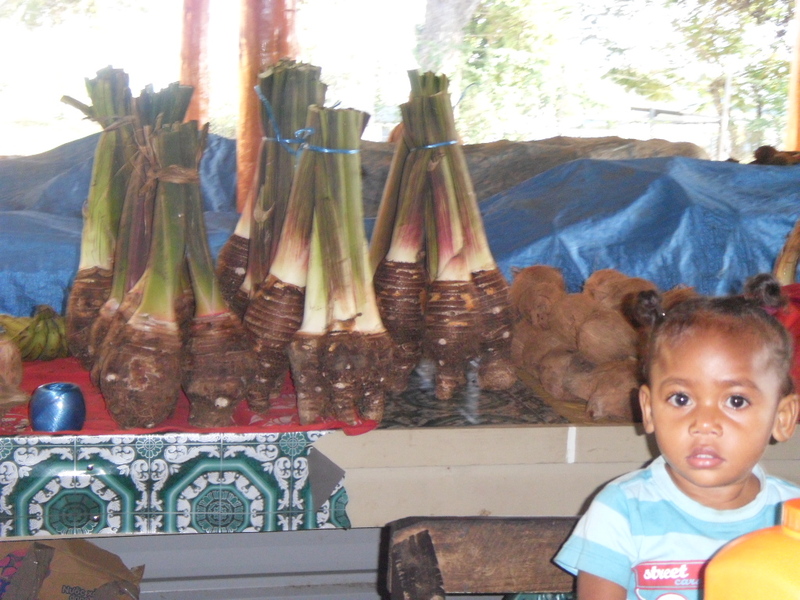 Fijian Dalo tends to be of a different texture then the ones we get here. It can be eaten with butter while hot. It’s lovely! More photos of varieties of Dalo and the one with the little girl was taken 2 seconds before she broke out in the loudest cry for all to hear. I guess a model and a beauty queen she will never be this one, because of her fear of the camera flash. She did spoil my photo taking moments. I wanted to take the Dalo stem and stick it on her head then she would look like a big crying Dalo. 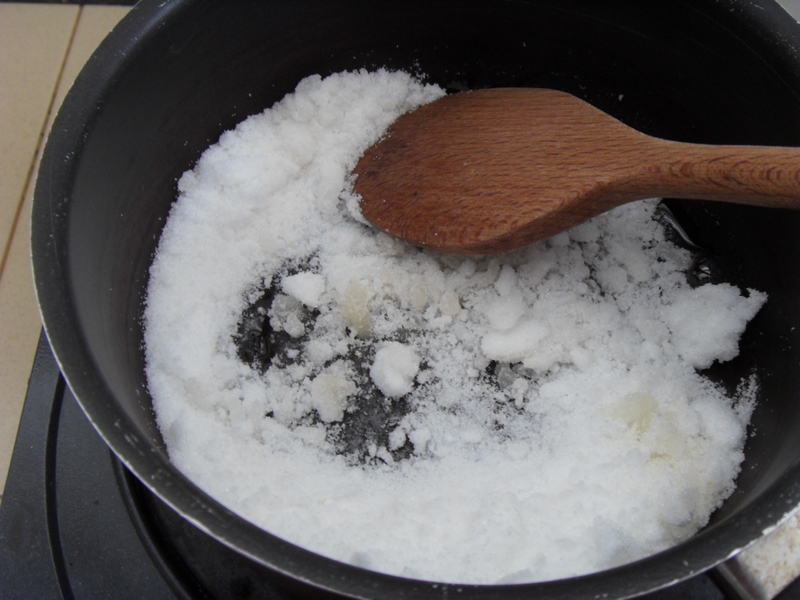 The last photo is Tahitian Chestnuts, which are boiled in salt water. It has its own distinct flavor, which Dan did not like very much. I ate the lot. 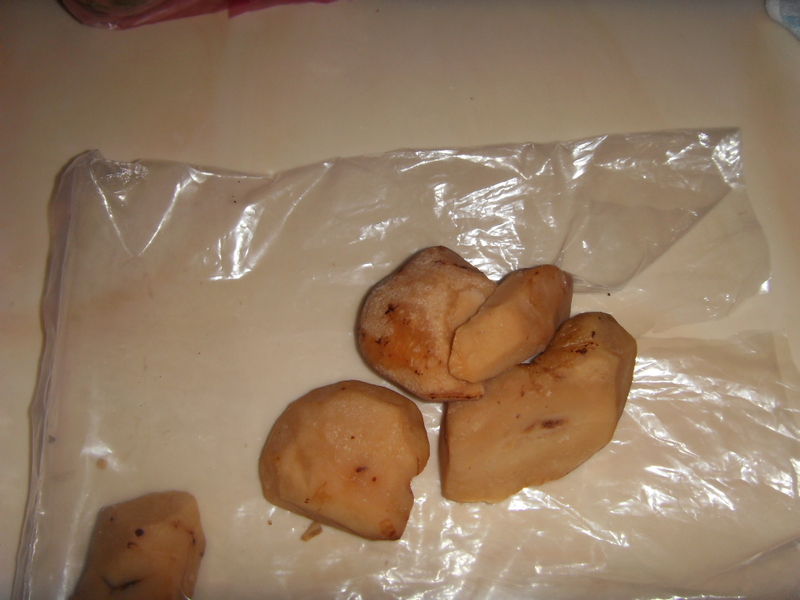 It does resemble boiled ginger and if Angela did not pick it up ( the last packet too), I would have never known. If you notice, I did not take and photos of the fish section. Well in Fiji the fish section in a separate section. It’s a closed up area as they wanted to keep out the flies. One step in on my second visit there, I nearly threw up and ran out for dear life. I had one of my dreadful childhood moments. The place reeked! Dan and Angela had no problem what so ever, I just was in there for 30 seconds and because totally nauseous. I did not understand their concept of closing off the area. I could not even hold up my camera because I was overcome by the smell. I did not have time to look at the fish as I got teary eyed. Maybe in my next visit to Fiji, I shall do it! It was a Wednesday night and since I was not in the best of health and was quite lazy to do anything else as we had quite an eventful day with Dan’s Sky Diving and then we went to this horrible horrible Kebab Place near the hotel, a name that I just cannot seem to remember but trust me its not worth remembering as the Kebab’s were lousy. Later I found out it was owned by a Malaysian. So there you go! As Angela had a heavy day and we were not too keen to go out to eat again, Angela brought home Pizza. Fiji’s own Mama’s Pizza. 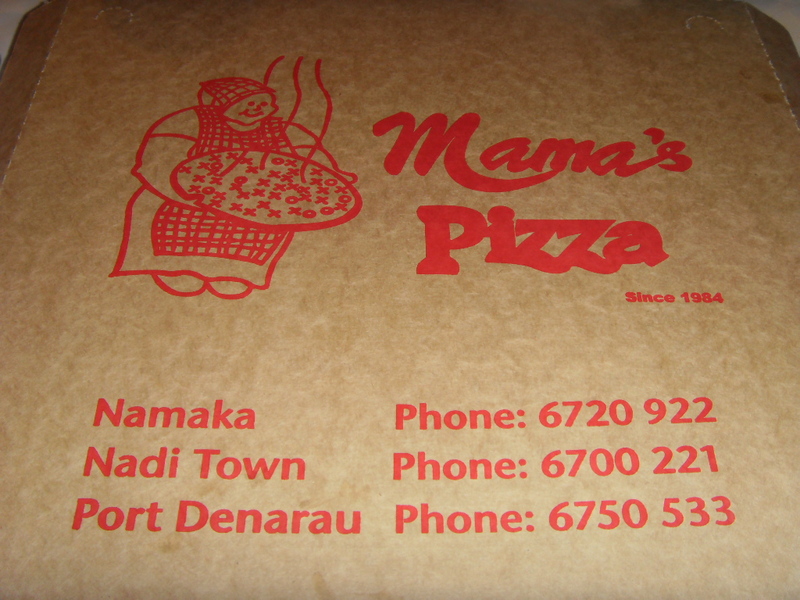 I had seen Mama’s Pizza in a few places as we were driving around Nadi (Pronounced Nandi). Now let me be straight with everyone here, I AM NOT FAN OF PIZZA! I may eat a tiny bit if it is a Pizza Margherita but I would scarcely touch normal pizza from the Pizza places around. I would eat a little from Italian restaurants but with moderation. So when Angela walked in the door after her Parents Teacher Meeting at Meretalai’s school, I notice it was a very large box she was carrying. The size I had not seen for a long long time not even in most of the Aussie Pizza places I have eaten at. So she opened it and announced it was a Meat Lovers Pizza and half was Hawaiian and the other half was Ground Beef, Ham, Pepperoni & savory sausage with BBQ Sauce. I was quite shocked that they did not stinge on ingredients as food ingredients especially importer food ingredients is expensive. I was curious, so I took a piece and after 5 pieces later I had to declare it was a very nice family made pizza. None of those pretentious nonsense we get with mozzarella cheese folded into the pizza bread and triple and double crust nonsense. 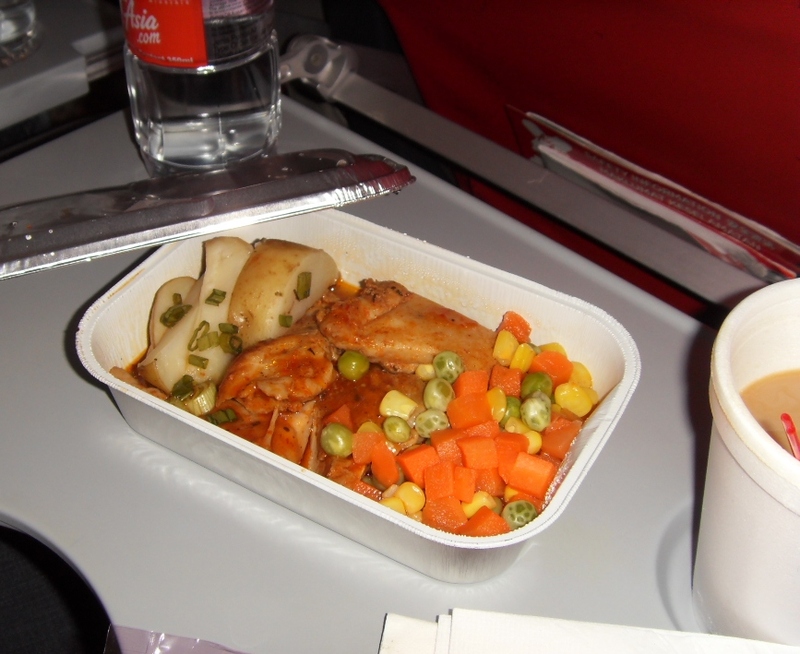 It was filled to the brim with meat, and not stingily too. The ration of meat and pizza bread was perfect unlike the ones we get in other places where more dough means we’re filled up faster. I must confess though, when Angela and I were in school, we actually used to fight for the crust! Mama’s Pizza is a Pizzeria Café, so you can dine in, take away and even get it delivered. Malaysia should start a home grown pizza place with no pretense and fluff. 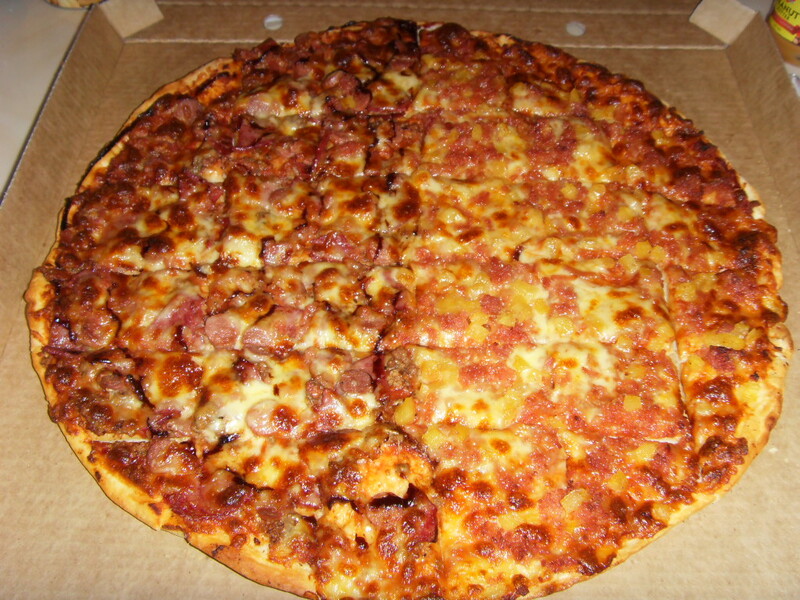 Mama’s Pizza has stood up to giants like Pizza Hut in Fiji, and with what we ate, I reckon Pizza Hut would have a good fight. Mama’s Pizza opened 26 years ago, by a single mum who needed the cash back then for her kids and the rest is history. A success story, and a lot of success to come. I am stressing this to Malaysians simply because we are so blinded by American Pizza and even Canadian, and look what this local woman did 26 years ago which was probably the same time we started getting into Pizzas. This should be made an example to young entrepreneurs out there. Anything is possible, you dish out good food, even the giants cannot fight you. And in the case of Mama’s Pizza, I believe the giants won’t be able to. By the way I forgot to mention the pizza was 45 cm across. We were all “pizzaed” out, we gave some to the teachers at the school later on. I would have loved to have gotten my hands on Mama’s Pizza’s Menu and actually dined there to feel the ambiance and just smell the whole restaurant. Read their history at their website. And to Robin Ragg the original Mama of Mama’s Pizza… You Go Girl!!!!!! Today we had to attend a funeral of my students my father in law, so I thought I’d take something for the wake. 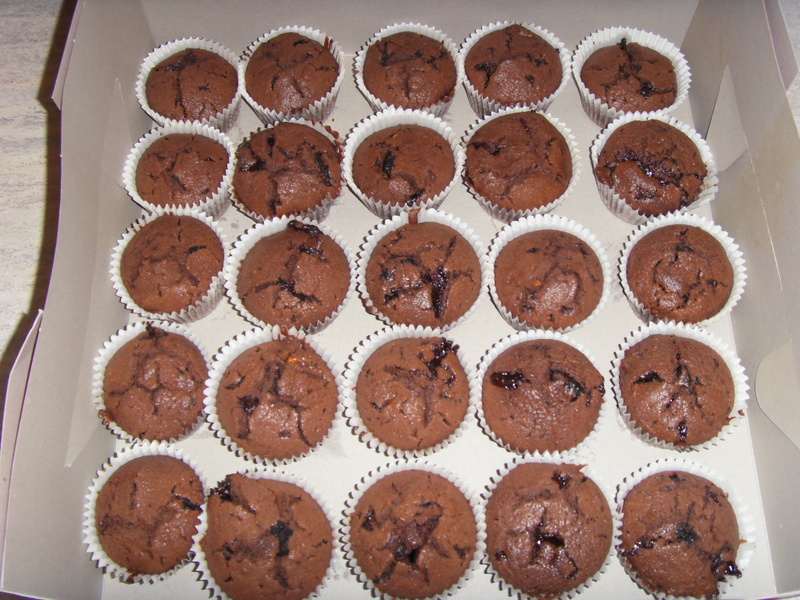 I pondered a while and since it was going to be an afternoon affair, I really could not be bothered lugging hot mee hoon or other foods, so after digging around my digging around my fridge, I thought I’d try a recipe of muffins using my hardened chocolate ganache from my class yesterday, and believe me I had quite a bit from other classes as well. 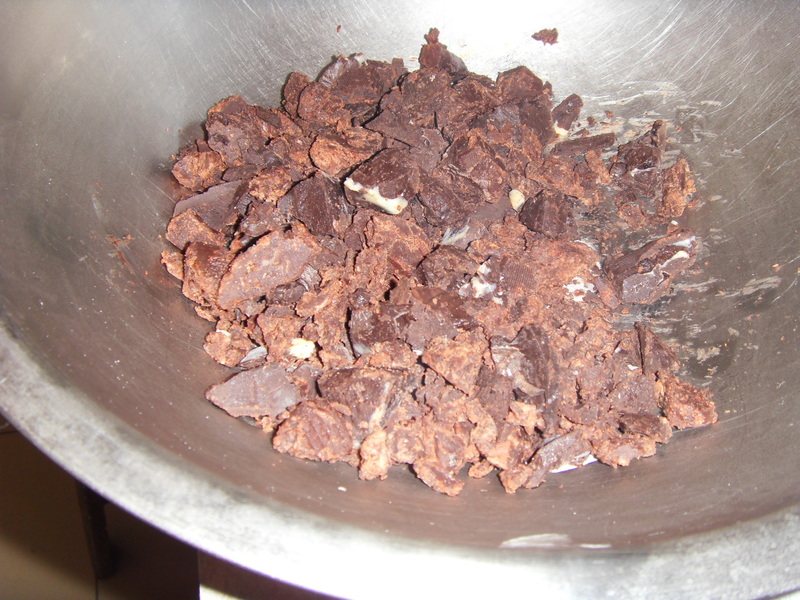 So I decided instead of normal chocolate chips, why not make it super chunky chocolate pieces. So I chopped up all the hardened chocolate ganache and placed it in the freezer. 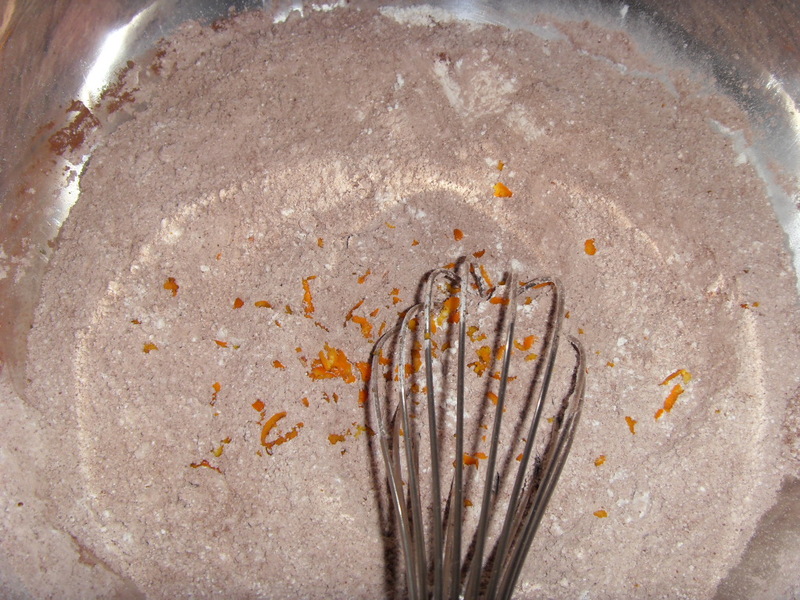 I weighed out the flour, 3 cups, 8 tablespoons of cocoa powder, then I remembered the oranges in the fridge, so I used the skin of three oranges, 1 cup of brown sugar, I ran out of milk so I used 2 cups of cream plus 1 cup of water, and I added in 2 cups of oil because I ran out of butter after yesterdays class, and 2 eggs. 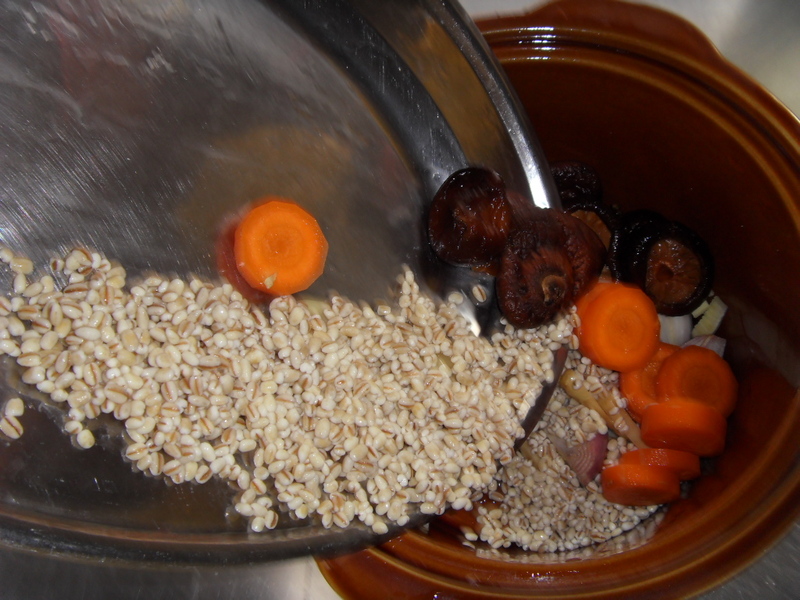 Mix all the dried ingredients, then add in the wet stuff. 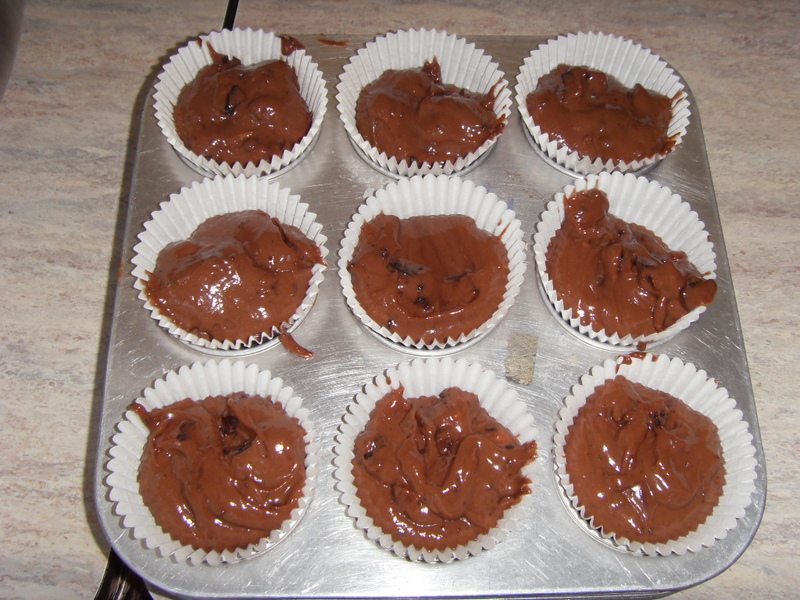 I mixed everything together and then added in the frozen chocolate chunks. 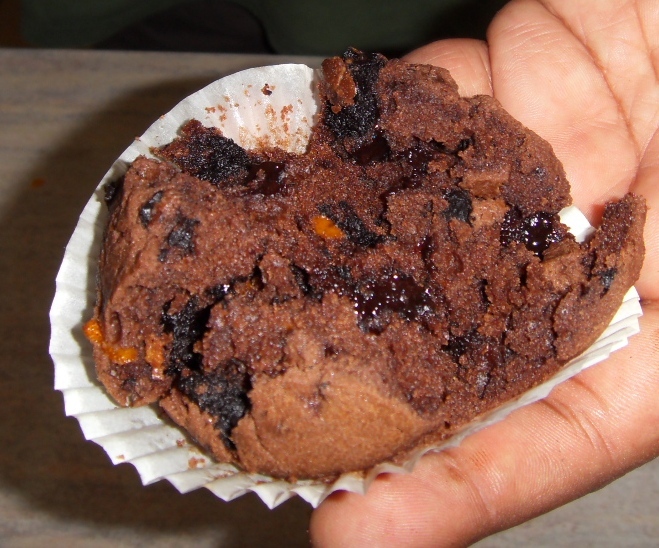 Cupped all the muffin batter, got exactly 30 cups and baked it at 180 C.
The result was a rather photogenic muffins with chunky chocolate pieces and speckles of orange peel. I had a tablespoon full, because my brother ate two of it as soon as it came out of the oven. Well hopefully these rather Happy Muffins will take away some sadness today. Sometimes when someone passes on let’s remember they are in a better place and let’s make a sad moment into one with smiles.